DePuy’s argument is twofold. First, its voluntary recall (I know it was voluntary because they have told us that 1000 times) should not be admitted because it is a subsequent remedial measure. Second, the probative value of the fact that there was a recall in 2010 is greatly outweighed by its potential for prejudice. Federal Rule of Evidence 407 excludes subsequent remedial measures when it provides that when measures are taken that would have made an earlier injury or harm less likely to occur, evidence of the subsequent measures is not admissible to prove: negligence, culpable conduct, a product or design defect, or a need for a warning doctors and/or patients. Why? Because you don’t want someone to not take a safety precaution because they are worried about having it shoved back in their face. There are some situations where the defendant cannot hide behind subsequent remedial measures. If the evidence of subsequent remedial measures is to show ownership or feasibility of precautionary measures, it can be admissible. But that is not what we have here in these suits. So DePuy wants to jump in this safe harbor. The federal judge overseeing the case agreed to let them avail themselves to this doctrine. I don’t like the ruling because I think the recall tells the jury so much about these cases… but I do understand the bigger picture wisdom, too. As I said, nearly 8,000 lawsuits are pending in federal court and more in state court. The federal cases are consolidated in an MDL, called multi-district litigation, before a judge in Ohio. In the state court cases, Plaintiffs are 1-1. We have an $8.3 million verdict in California and a loss in Illinois. There is no doubt that we are going to win some of these cases and lose some of these cases. My guess is that the balance weighs heavily in plaintiffs’ favor because I think we win a lot more than we lose. But look, even at the current pace, that is an average of $4.15 million per case. Is this a small sampling size? Of course. Is the actual settlement value of these cases less that $4 million? Yes. But, that said, this theoretical average could be moving up and up and DePuy ought to be worried about it. Which is why I think this case heading for trial in Cleveland will likely settle. I can’t believe DePuy wants to risk another verdict. 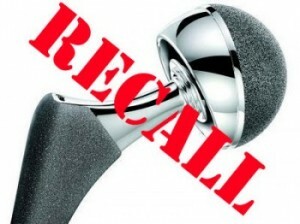 Are you a potential DePuy hip plaintiff? If you are, I’m worried about the statute of limitations in your case which varies from jurisdiction to jurisdiction. Call us today to find out if you have a claim at 800-553-8082 or get information on-line.